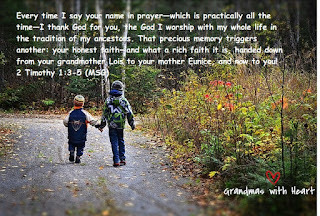 grandma's cookie jar: Grandmas with Heart - Please Check Us Out! At any rate, while giveaways are fun - and a whole month of giveaways is even more fun - giveaways are not the reason I write grandma's cookie jar. 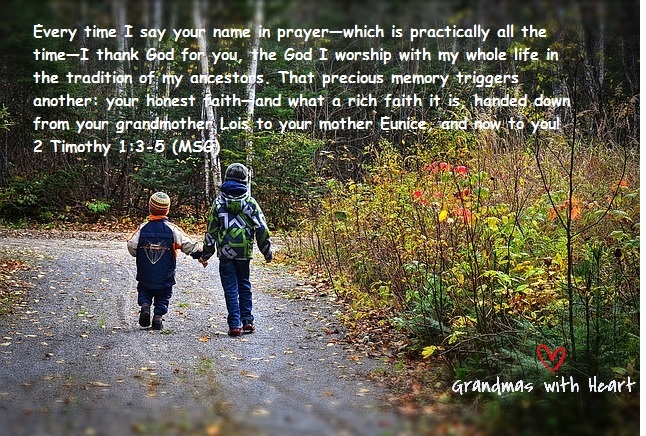 I write it to help encourage and equip you to hand down faith to the children you love. Two years ago I became part of a new ministry - the Legacy Coalition. It is our vision to equip grandparents to be intentional about handing down their faith and to call upon churches to be focused when it comes to equipping the grandparents in their ministries, so they will be able to hand down the faith. I love the ministry of the Legacy Coalition and am so happy to be part of it. I'm also happy to say, along with being part of the Legacy Coalition, last Spring I was burdened to focus more upon calling together a team of grandmas who will create resources for grandmas (although grandpas and parents will like them as well). These resources will equip and empower them to hand down their faith. So far I have five wonderful grandmas who are part of the team which makes up this new ministry - Grandmas with Heart! We are just beginning and over the coming days and weeks I'll introduce you to these wonderful grandmas, but today I want to invite you to follow along with us as we grow. You will be able to do this by visiting and liking our facebook page - at this link. Please check out Grandmas with Heart, like our facebook page and share it with the grandmas you know.